In the Northwest of the city there is a long, low embankment cutting directly across the plain. This is the mizuki or "Water Fortress," which was built in 664 A.D. to defend the Dazaifu against a possible invasion from Tang China and/or the Korean kingdom of Silla. 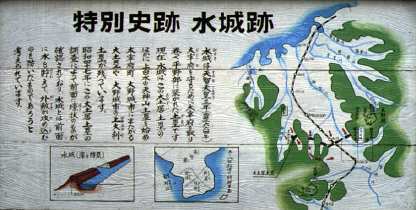 In 663 Japan fought against the allied forces of Tang China and Shiragi Korea, at Hakusukinoe on the Korean Peninsula Japan was defeated, so the Japanese government thought that perhaps China and Korea would attack Japan. The branch of the government located in Hakata was moved to Dazaifu, 20 km away from the coast, and an earthen fort was constructed for protection the the north. In 663 there had been a disastrous Japanese military defiat on the Korean peninsula, and no doubt an invasion was feared in its wake. 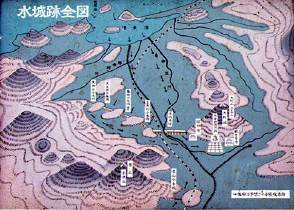 The Dazaifu was proteted by "water ramparts", apparently a series of moats formed by damming various rivers. 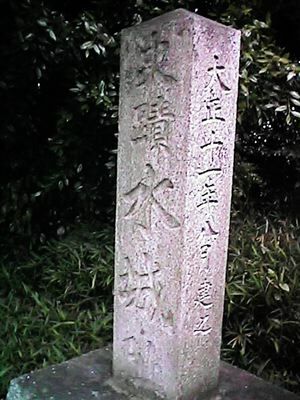 Today a monument stands on the site of the old fortifications, just before one reaches the Dazaifu on the road from Fukuoka. 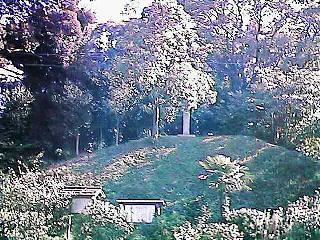 Structure Smaller embankments of the same type as the Mizuki are found in Kasuga City and Onojo City. Walk for two minutes from JR Mizuki Station.